You foxy thing. Oh yes. My best-kept fashion secret is that I dress predomninantly in mum shops. Along with the Monsoon sales rack (superb dresses, far too expensive at full-price) Marks and Spencer has been my hero shop for years. Yes, even in 2006 when I was running a festivals website and had an angsty Hoxton fin haircut - well, as angsty as can be found on someone living in Clapham. I popped into the super massive M&S in Westfield-Stratfield the other day and had one of those moments of sheer shopping joy that happens roughly once every two years, when you walk into a shop and you know that EVERYTHING you see is going to look bloody amazing on. M&S isn't quite there yet - I tried on a lot, and the jumpers were a bit too big, and the skirts I particularly liked had amazing patterns but a weird fit. However, I fell in love with this Limited Collection animal print top. 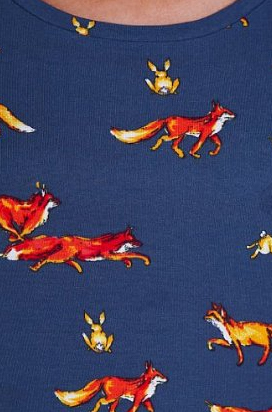 It's £19.50 and stuffed full of foxes and rabbits in fantastic colours - and that blue is just. Wow. It's a really good blue. Also good are the sleeves. I have a pathological dislike of my upper arms, caused by spending my teenage years working in a stable (muscles! I built them!) and then spending most of my 20s in a state of carefully artistic drunkenness (muscles! I wasted them!). Sleeves are my friend, and the ones on this shirt are a good length, as well as having enough of a flare to skim over any non-fun bits. Great neckline too, and the looser fit is very flattering, and has a nice nipped-in waist. You can also get this print on a burgundy thin jumper for £29.50, but there are so many other lovely thin jumpers in the M&S range right now that I'd splash out on the shirt and keep an eye on the others, and certainly the autumn range when it comes in. Brilliant. I saw that top in M&S the other day and gravitated towards it. My only issue with it was the price. Perhaps when I get a job I'll treat myself to it! Allie, YES! 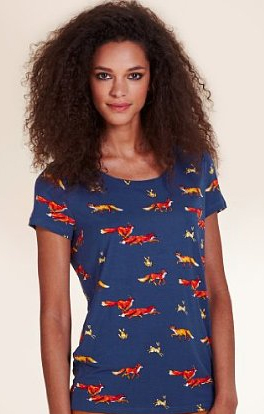 I tried on the horses one, but it was a bit too big in my usual jumper size - I love the owls one as well. They're fantastic! @teacakemake Do it! M&S tops last forever. Part of the reason I shop there and at Monsoon is because of the quality. I've never had truck with a lot of the fashionable high street names who do that price or higher because invariably they charge £40 for a seethrough piece of cotton that falls apart when you so much as point it at a washing machine. I too almost bought this the other day and have been pondering it ever since. I think this might be the push I needed...foxes! And bunnies! How can I not? Was also tempted by an owl dress but can one have too many owl dresses? I was walking out of M&S the other day when I spied this, grabbed the only one in my size, turned around and went straight to the check out. Love it! It's all a little Animals of Farthing Wood. That's a good thing.